Azhy Robertson, born on January 10, 2010, has appeared in Law & Order: Special Victims Unit (2016), a couple of episodes of The Americans (2018), had a turn with Rose Byrne and Ethan Hawke in Juliet, Naked (2018) and has appeared on Saturday Night Live a couple of times (2016 - 2018). 2018 seems to be this young man's break-out year with an amazing performnce in Beyond the Night. "And child actor Azhy Robertson (seen recently in Juliet, Naked) delivers a haunting turn as the traumatized little boy in "Beyond the Night".- Hollywood reporter. 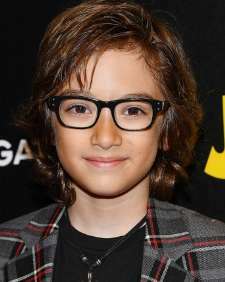 Young Azhy Robertson plays Lawrence, a boy who seems to know a lot about the disappearance of a mysterious girl. He handles his character exceptionally well and makes the film work. He does a good job of being shy when others look at his strange facial birthmark, yet loving with his newly introduced relatives. His character has to be cautious on what he says since his dad doesn’t believe him, coy when he has to evade questions from some of the callous aggressors, act hurt when youngsters make comments about his affliction, and several other emotions including fear. He handles his character exceptionally well and makes the film work. Director Jason Noto: "Yeah, it was slightly challenging to cast Azhy Robertson because we had to go through about 40 or 50 kids, but ultimately, I enjoyed the process. And Azhy is a whip. He reminded me so much of Timothée Chalamet in his level of professionalism and his understanding of his surroundings. It was just spot-on. Like if an adult actor opposite him messed up their lines, he would call them out. He was very, very sharp." The young actor has several movies in the can, including Noah Baumbach's latest, an untitled comedy that also stars Scarlett Johansson and Adam Driver. You can see him opposite Julianne Moore and Billy Crudup in the newly release 2019 After the Wedding. Jennifer Ortega: Well, first of all, happy birthday! You have really good taste already at nine. So is there any scene you’re excited to see? Did you already see it when it was at any of the festivals? Azhl is repped by CESD Talent, Nani Saperstein Management and Nelson Davis.